Some foods are known to have flavours that cannot be explained by the five basic tastes alone, such as continuity, mouthfulness and thick flavour. It was demonstrated that these sensations are evoked by the addition of kokumi substances, flavour modifiers that have no taste themselves. However, their mode of action has been poorly understood. During a study on the perception of amino acids and peptides, it was found that glutathione (GSH) was one of the agonists of the calcium-sensing receptor (CaSR). We have hypothesized that CaSR is involved in the perception of kokumi substances. We found that all CaSR agonists tested act as kokumi substances and that a positive correlation exists between the CaSR activity of γ-glutamyl peptides and kokumi intensity. Furthermore, the kokumi intensities of GSH and γ-Glu-Val-Gly, a potent kokumi peptide, were significantly reduced by the CaSR-specific antagonist, NPS-2143. These results suggest that CaSR is involved in the perception of kokumi substances. A potent kokumi peptide, γ-Glu-Val-Gly, enhanced sweetness, saltiness and umami when added to 3.3% sucrose, 0.9% NaCl and 0.5% MSG solutions, respectively. In addition, γ-Glu-Val-Gly enhanced the intensity of continuity, mouthfulness and thick flavour when added to chicken soup and reduced-fat cream. These results suggest that γ-Glu-Val-Gly is a potent kokumi peptide and would be useful for improving the flavour of food. Recent developments in molecular biology have demonstrated that the five basic tastes, sweet, salty, sour, bitter and umami are recognized by specific receptors and transduction pathways. However, some foods are known to have flavours that cannot be explained by the five basic tastes alone, such as continuity, mouthfulness and thick flavour. Ueda et al. have previously investigated the flavouring effect of garlic extract that enhanced continuity, mouthfulness and thick flavour when it was added to an umami solution. These authors demonstrated that several sulphur-containing compounds, identified as S-allyl-cysteine sulfoxide (alliin) and glutathione (GSH, γ-Glu-Cys-Gly), were responsible for this effect. Although these compounds have only a slight flavour in water, they substantially enhance the continuity, mouthfulness and thick flavour when added to an umami solution or various foods. They proposed that substances with these properties should be referred to as “kokumi” substances. However, their mode of action has been poorly understood. In this study, we aimed to clarify the mechanism of the perception of kokumi substances and the sensory characteristics of the potent kokumi peptide, γ-Glu-Val-Gly. During a study of a G-protein coupled receptor (GPCR) that perceives amino acids and peptides, we found that GSH was one of the agonists of the calcium-sensing receptor (CaSR). We have hypothesized that CaSR was involved in the perception of kokumi substances. First, the kokumi intensity of various CaSR agonists was investigated. It was demonstrated that all CaSR agonists tested, such as Ca2+, protamine, polylysine, L-histidine and γ-glutamyl peptides, enhanced the taste intensity of umami-salty solutions. Second, since GSH (γ-Glu-Cys-Gly) was a potent kokumi substance, various γ-glutamyl peptides, such as γ-Glu-Ala, γ-Glu-Val, γ-Glu-Cys, γ-Glu-Abu-Gly (Abu: α-aminobutyric acid) and γ-Glu-Val-Gly were synthesized. The CaSR activity of these peptides was measured according the method previously reported, and the kokumi intensity was measured by sensory evaluation as described previously. The results are indicated in Figure 1, and they reveal that the CaSR activity of γ-glutamyl peptides is significantly and positively correlated to the kokumi intensity measured by sensory evaluation (r = 0.81, p < 0.05). Thirdly, the kokumi intensities of GSH and γ-Glu-Val-Gly, a potent kokumi peptide, were significantly reduced by the CaSR-specific antagonist, NPS-2143. These results therefore strongly suggest that CaSR is involved in the perception of kokumi substances. In addition, we tried to investigate the response of taste cells to kokumi substances using a slice of mice taste buds. It was demonstrated that certain taste cells responded to the stimulus of kokumi substances and this response was significantly suppressed by the CaSR-specific antagonist, NPS-2143. These results suggest that CaSR in taste cells is involved in the perception of kokumi substances. 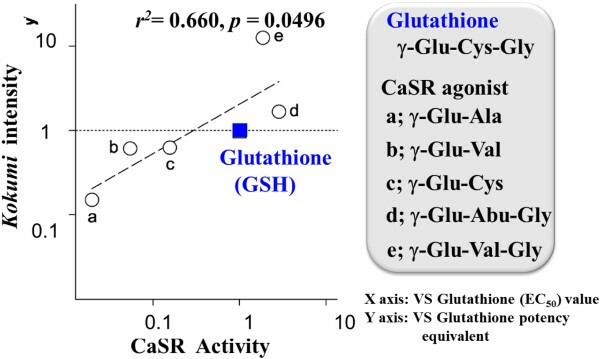 The correlation between the CaSR activity andkokumiintensity of various γ-glutamyl peptides. The CaSR activity and kokumi intensity were measured by a methods described in. The kokumi intensity of γ-Glu-Val-Gly was measured by the point of substantial equivalent (PSE) method described previously. The sensory evaluation demonstrated that 0.01% solution of γ-Glu-Val-Gly produced a kokumi equivalent to a GSH solution of 0.128%. Therefore, we estimated that the kokumi intensity of γ-Glu-Val-Gly was 12.8 times stronger than that of GSH. This result suggests that γ-Glu-Val-Gly is a potent kokumi substance. Next, we investigated the effect of γ-Glu-Val-Gly on the basic tastes (sweet, salty and umami). As results of the sensory evaluation with the trained panelists (n = 20), the addition of 0.01% γ-Glu-Val-Gly significantly enhanced the intensity of sweetness, saltiness and umami, although they have no taste themselves (data not shown). These results suggested that γ-Glu-Val-Gly has a property of kokumi substances. In addition, the effect of γ-Glu-Val-Gly on foodstuff was investigated. γ-Glu-Val-Gly was added to chicken consommé soup (prepared from the commercial “Chicken consommé” powder) at a concentration of 0.002%. The sensory evaluation with the trained panelists (n = 20) indicated that the addition of γ-Glu-Val-Gly significantly enhanced the intensity of thickness, continuity and mouthfulness. In the study, thickness was defined as increased taste intensity at ~5 s after tasting, continuity was expressed as the taste intensity at ~20 s and mouthfulness was defined as the reinforcement of the taste sensation throughout the mouth just not on tongue. Furthermore, the effect of γ-Glu-Val-Gly on the flavour of low-fat custard cream (15% fat content; fat in full-fat custard cream is approximately 40%) was evaluated with trained panelists (n = 19). 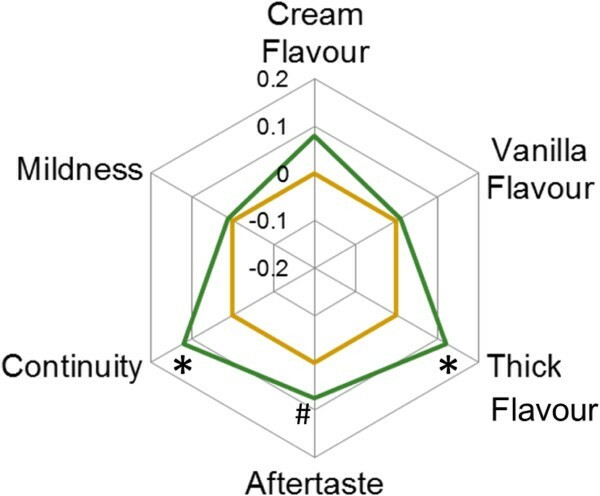 As shown in Figure 2, the addition of γ-Glu-Val-Gly at 0.004% significantly enhanced the intensity of “thick flavour” (thickness of taste; the enhancement of taste intensity with maintaining the balance of taste) and continuity (p < 0.05) and tended to enhance the intensity of aftertaste (p < 0.1). These results suggest that the potent kokumi substance, γ-Glu-Val-Gly, can be used to improve the flavour of various foods. The effect of the peptide on the flavour of various foods is investigated in our laboratory. Sensory characteristics of low-fat custard cream with added γ-Glu-Val-Gly. A yellow line indicates the mean scores of the control low-fat custard cream. A green line indicates the mean scores of the low-fat custard cream with 0.004% of γ-Glu-Val-Gly. In this study, the mechanism of the perception of kokumi substances was investigated. All CaSR agonists were kokumi substances, and a CaSR-specific antagonist decreased the kokumi intensity. Further, the CaSR activity correlated with the kokumi intensity. These results suggest that CaSR is involved in the perception of kokumi substances. Sensory analyses revealed that γ-Glu-Val-Gly had a kokumi intensity 12.8 times stronger than that of GSH and that it enhanced intensities of mouthfulness, thickness (or thick flavour) and continuity of food, suggesting that γ-Glu-Val-Gly is a potent kokumi substance. We sincerely thank Dr. Kiyoshi Miwa and Dr. Yuzuru Eto of Ajinomoto Co. Inc. for their encouragement and continued support of this work. We are grateful to Dr. Tohru Kouda, Dr. Yusuke Amino, Dr. Yutaka Maruyama, Dr. Toshihiro Hatanaka, Mr. Hiroaki Nagasaki, Mr. Tomohiko Yamanaka, Mr. Sen Takeshita, Dr. Takeaki Ohsu and Mr. Shuichi Jo of Ajinomoto Co. Inc. for their assistance. There is no funding in the present study. NM designed the construction of this paper. NM and MK collected the data of sensory analysis. MK wrote the manuscript. Both authors read and approved the final manuscript.